By car: take the A61 highway, Carcassonne EST exit. Follow signs for "La Cité" and then "Hotels" (opposite the main entrance, on the left). Please note that access to the Cité is regulated. Contact the hotel for more information. The hotel's historic cellar with its brick ceiling and terracotta floor is an unusual place and is the ideal spot for an exclusive tasting session to sample the wines of the Languedoc. Choose your tipple according to your tastes: the appellation, organic wines or the range of wines from the Languedoc region. Place Auguste Pierre Pont La Cité . 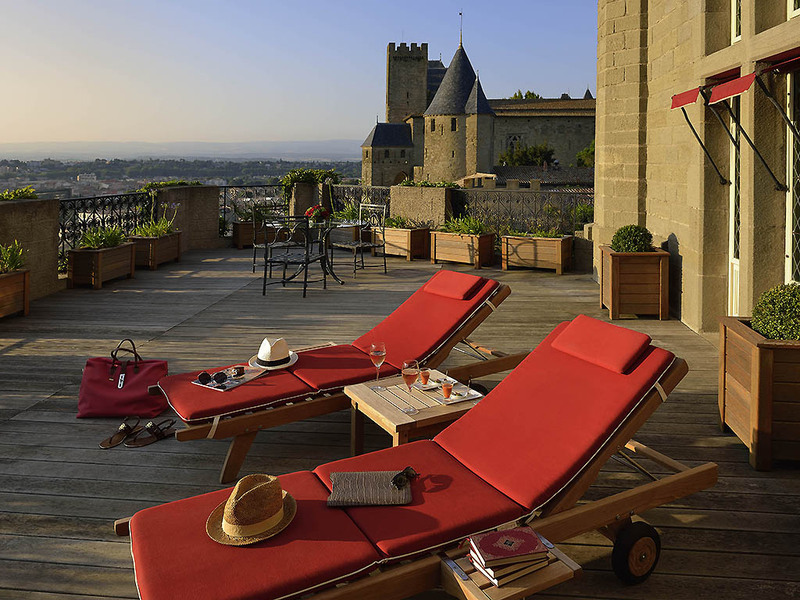 The Cité de Carcassonne hotel is a historic hotel with an amazing history situated in the heart of the medieval fortress. Overlooking the lower town, it offers an amazing panoramic view of the city walls. Each guest is greeted at the foot ..
For more than a century, Hôtel de la Cité Carcassonne MGallery by Sofitel has participated in the history of this walled medieval city. A stay here means more than just 5-star luxuries and amenities. For you, we open the doors to a special place. Let yourself be charmed by the hotel's ivy-covered walls as you stand at the foot of a fortress listed as a UNESCO World Heritage site. 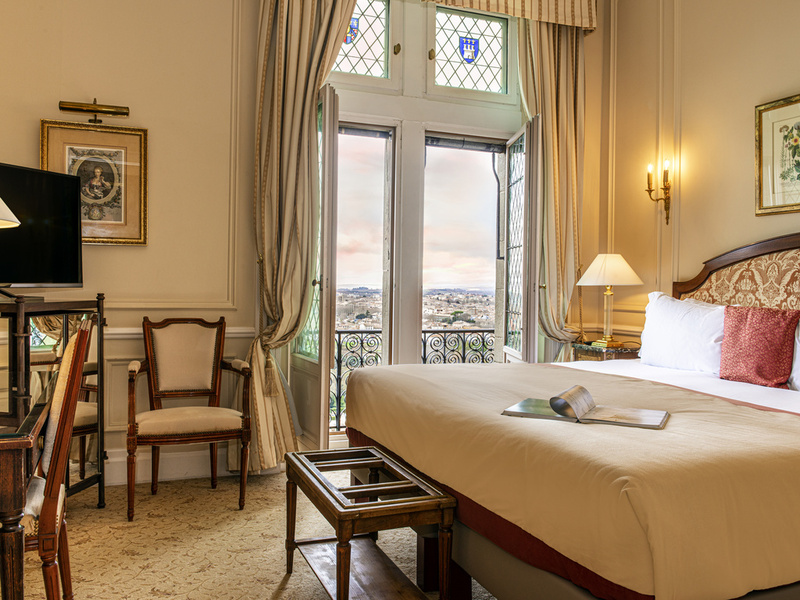 Within the ramparts, your rendezvous with history begins at the hotel's grand wooden staircase, a historic monument. Driven by their passion for Carcassonne, our gracious staff shares with you the secrets of this city within La Cité. Explore gardens and hidden recesses to discover a patio and bubbling fountain, or the secret passageway that festival artists once used. On sunny days, travel back in time across Southern France aboard a barge on the Canal du Midi, where rows of plane trees grace the banks. In any season, our sommelier helps you discover the best vintages of the region during a private wine tasting. 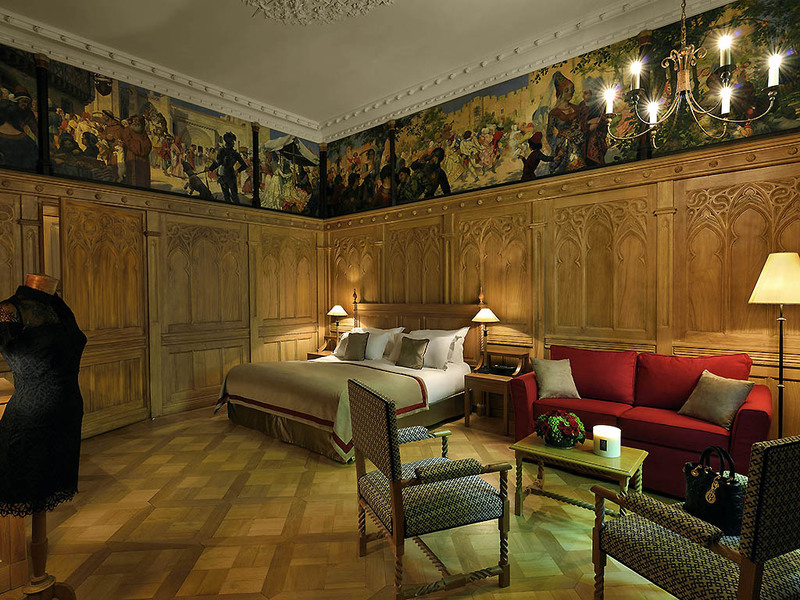 Sculpted wood paneling, ornamental tapestries and stained-glass windows - everything comes together to create a warm and intimate atmosphere. 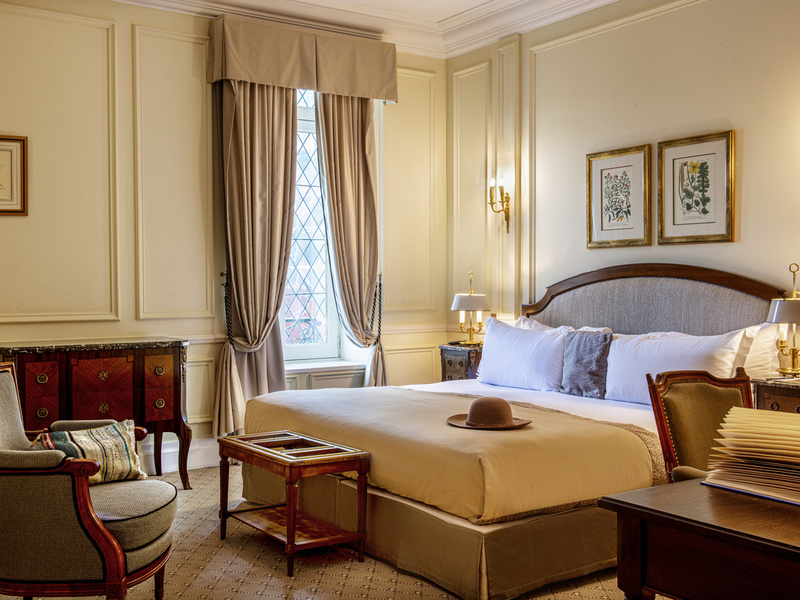 Spacious rooms elegantly decorated in a sophisticated French style and pleasantly furnished thanks to the know-how of local artisans. Unwind in the luxury and serenity of a spacious, uniquely decorated suite. From your separate living room or private terrace, Carcassonne reveals its full glory. Admire the walled city's alleyways, ramparts and medieval church. 269 sq. ft. (25 m²), marble bathroom with bathtub, minibar, safe, tea and coffee making facilities, iPod station, 42" TV, DVD player, robes, slippers. The bed may be turned into twin beds on request. 376 sq. ft. (35 m²), marble bathroom with bathtub, minibar, safe, tea and coffee making facilities, iPod station, 42" TV, DVD player, robes, slippers. 269 sq. ft. (25 m²), marble bathroom with bathtub, minibar, safe, tea and coffee making facilities, iPod station, 42" TV, DVD player, robes, slippers. The bed may be turned into twin beds. 484 sq. ft. (45m²), marble bathroom with bathtub and separate shower, minibar, safe, tea and coffee making facilities, iPod docking station, 48" TV, DVD player, robes, slippers. 592 sq. ft. (55 m²), separate lounge, marble bathroom with bathtub and separate shower, minibar, safe, Nespresso machine, iPod station, 48" TV, robes, slippers. 592 sq. 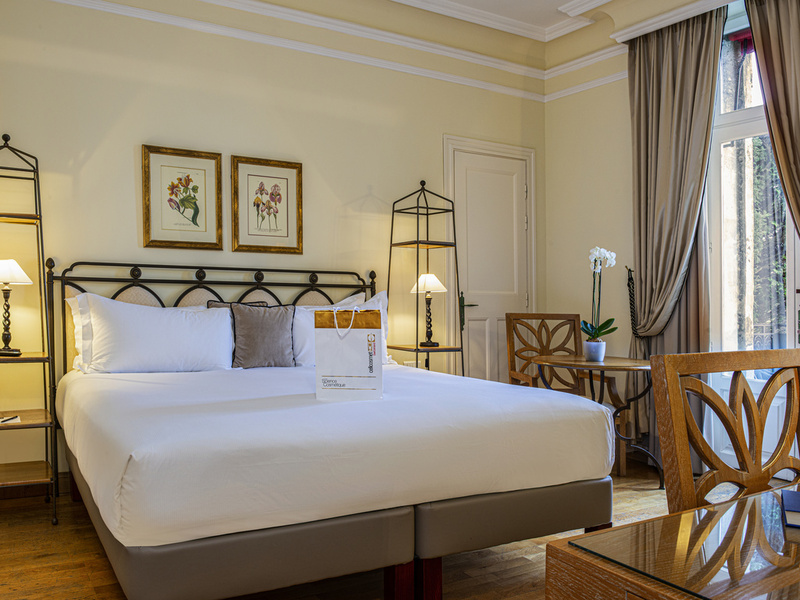 ft. (55m²), terrace, garden/rampart view, separate lounge, marble bathroom with bathtub and separate shower, minibar, safe, Nespresso machine, iPod station, 48" TV, robes, slippers. 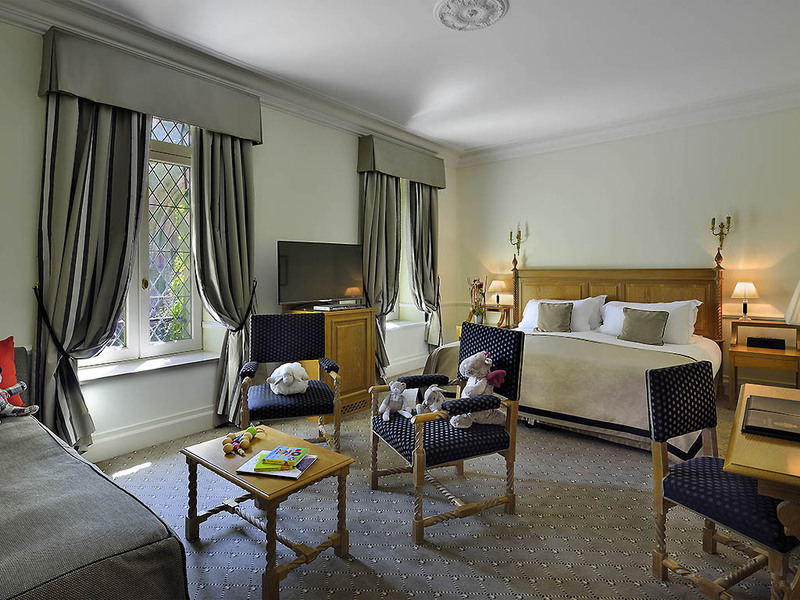 At any time of day or night, our rooms service offers regional dishes and a selection of the area's finest wines. Savor our delicious homemade pastries, refined small bites and authentic Languedoc gastronomy in the comfort of your room or suite. The Hôtel de la Cité has a reputation for gastronomy with its Michelin-star restaurant, La Barbacane, designed in a neogothic style. You will be seduced by its fireplace, high ceilings and cathedral chairs. Equipped with top-of-the-range audiovisual equipment with a giant screen, VCR, digital overhead projector and photocopier, this hotel can organize seminars, cocktail parties and receptions for up to 250 guests. Numerous activities (medieval banquets with troubadours and minstrels, medieval jousts, regional wine tasting or cruises along the Canal du Midi) can be organized on request. A terrace with stunning views of the lower town, which has seen more than its fair share of marriage proposals. A haven of peace at the foot of St. Nazaire Basilica, take advantage of our Cinq Mondes spa. A swimming pool is available in season, from May to the end of September, and there is also a summer bar (subject to weather conditions). When you wish to venture beyond the walls of this medieval city, you can explore greater Carcassonne in total freedom with a chauffeured vehicle. Contact the front desk to make your reservation. In the heart of the garden, at the foot of Basilique Saint-Nazaire, the pool stretches out over greenery and history-steeped stone in this unique setting. During the summer, linger at the outdoor bar. Off season, enjoy a swim in perfectly heated waters.